The first of its kind in the nation, the Georgia Cancer Coalition exchanges and records data electronically to gain an edge in the war against the deadly disease. Using HIT to improve workflow and efficiency is important. Using HIT to gather real-time data to help make a measurable difference in improving the lives of cancer patients is even better. The Atlanta-based Georgia Cancer Coalition launched The Georgia Cancer Quality Information Exchange (The Exchange) to design, retrieve, and aggregate clinical information and public health data to assess and advance the progress of the state’s cancer care. The initial focus of The Exchange is a response to the 2005 Institute of Medicine report “Assessing the Quality of Cancer Care: An Approach to Measurement in Georgia,” which presents a set of 52 top-priority quality measures for cancer care. The measures address all stages of the cancer continuum: prevention, screening and early detection, diagnosis and staging, and treatment and palliation. The program focuses on improving cancer outcomes by measuring results to enhance process improvement and, ultimately, patient care. “The question was, how can we measure the outcomes? On behalf of the Georgia Cancer Coalition, the Institute of Medicine conducted a three-year study that resulted in 52 clinically relevant metrics. If we demonstrate improvement in these areas, we should see a measurable decrease in cancer mortality and illness,” says Pam Arlotto, CEO of Maestro Strategies, which is serving as consultants on the project. Some of the metrics deal with all cancers combined, while others target the four most prevalent and deadly adult cancers in Georgia: breast, prostate, colorectal, and lung. Bill Todd, CEO of the Georgia Cancer Coalition, sees the initiative as a long-term strategic move to dramatically improve the state’s quality of cancer care. He notes the substantial benefit of measuring results in aggregate and the value of disaggregating the information, which can provide beneficial performance feedback to communities, hospitals and hospices, and physician practices. “This helps meet the goal of the second half of our motto. ... Motivating change comes alive when people get feedback to act on,” he says. The Exchange is not driven by regulatory requirements; participation is voluntary. “The first adopters are those who have been viewed as serious about quality and want the information, who feel they need it to correct actions when needed, and who are constantly looking for a way to improve,” says Todd. Currently in its pilot phase, The Exchange includes six demonstration partners who are engaged in the proof of concept. As such, they are working to test the quality measures; establish common definitions, standards, data collection protocols, and data validation; collaborate with their peers from other organizations to improve clinical performance; and apply research and best practices in clinical settings. One of the first challenges was deciding how to collect the data. Arlotto helped develop strategies that used EMRs and other tools to extract the information. But rather than focusing on the technology first, the initiative instituted six demonstration projects focusing on breast, lung, and colorectal cancers where the metrics were followed at the point of care. Once the point-of-care data were recorded, the EMR later grabbed and categorized the data to use them to improve workflow. Launched in January, the Technology Proof of Concept project provided a process to collect and aggregrate the data from the medical record, deidentifying patient-specific information and eliminating duplications. Physicians are not wary of participating because each facility has its own private scorecard of how it is meeting the metrics and can compare itself anonymously to other participating facilities. The aggregated, deidentified data reside safely in a data repository that is administered through a neutral third-party technology provider and can be accessed through a unique portal. 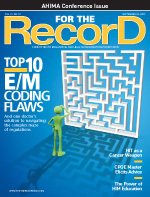 Data come primarily from the EMRs of participating practices and hospitals. Currently, the repository is updated once per week, which is more frequently than traditional surveillance. “We can update it more often but haven’t had the need to because the data is already providing such good feedback,” says Arlotto. The aggregated data have proven valuable for implementing process change at the point of care, which the current metrics are focused on. In the long term, the data also provide a valuable source for researchers and have the capability to expand to more health information exchange services that would allow the transmission of real-time data regarding patient care. Thus far, Todd has seen evidence that implementing the metrics and using the data have already promoted change in processes that have led to improved patient care. “One facility thought it was performing better in a particular measure but was horrified to find that they were actually out of compliance. They regrouped and changed processes to not only put them back into compliance but decided to further improve the processes to do even better,” he says. Because the 52 metrics are clinically relevant and based on scientific measures, and studies have demonstrated that quality will improve, physicians have been unabashed in championing the program. Todd also notes that when participants understand that the individual patient’s data will be collected in a way that is HIPAA compliant and aggregated, they no longer hesitate to join. Among the benefits that The Exchange has already been able to measure are a decrease in pain for cancer patients, improved turnaround time between diagnosis and intervention, and an increased number of patients advised for smoking cessation. “We learned how to take this evidence and bring it to patient care by using technology tools,” says Arlotto. As the initiative has gained steam, the number of providers interested in participating has grown. As a result, The Exchange has expanded its scope. “We initially started with the thought leaders at institutions that were at the leading edge of quality and performance. Since then, we have a backlog of healthcare providers waiting to get on board,” says Todd. Ultimately, Todd won’t be satisfied until all 38 accredited cancer treatment programs and the remaining cancer care providers across Georgia are all participants. However, he knows successful implementation must be done a few organizations at a time. Deciding who will be added to the program is somewhat systematic, with a facility’s institutional capacity and enthusiasm for the project as strong factors. Also considered are a potential participant’s EMR capabilities. “We try to balance the program with facilities that might be at the lower end of EMR adoption with those who are far along in the implementation process,” Todd says. “We also look at geography because the incidence of different types of cancers varies throughout the state.” By considering many factors, The Exchange boasts participants from a cross-section of Georgia. According to project leaders, physicians would like to see an increase in the number of metrics to improve the quality of patient care even further. As for registrars, they have seen a change in their roles as they become a collaborative part of the care team. Arlotto says, historically, registrars have conducted the majority of their work after care has been administered, collecting data and ensuring accuracy. In The Exchange, registrars have become an important asset during the care process. For example, at one demonstration site, a registrar participated in the multidisciplinary tumor board ensuring data was collected in real time within the EMR at the point of care (see sidebar). From the beginning, Todd says The Exchange’s main goal was to improve the quality of patient care. However, once the results became apparent, he found that there were financial implications as well. “Part of this project is built on the belief that quality healthcare is less expensive. It costs less to keep people healthy the first time around,” he says. Looking ahead, Todd hopes The Exchange will be a leader and model for others looking to use electronic data to provide clinically relevant information that will improve cancer care. “Once we have all the facilities in Georgia on board, we hope to share our lessons learned with the other 49 states,” he says. “Our partners are the public health system, hospices, the community. … It’s a team effort. We are simply the glue that keeps it all together,” he adds. Similar to how transportation engineers devise the best way for travelers to get to their intended destinations in the most expeditious way, HIT has put Georgia cancer registrars in the position of becoming “information engineers”—they help get the right information to the right people for the right reasons. Dolores McCord, RHIT, CTR, a veteran with more than 25 years in the cancer registry field and the manager of cancer analytics at Atlanta’s Piedmont Hospital, has witnessed a shift in her responsibilities ever since the facility became a demonstration site for The Georgia Cancer Quality Information Exchange (The Exchange). Now, the department’s work reaches further into the care process. “There is definitely a value placed on what the registry can offer to a whole cancer program, especially when they realize the information that can be provided,” says McCord. Cancer registries are what McCord refers to as a “necessary evil” because, according to the law, facilities are required to report all cancers and to be able to provide the information to state registries. As a demonstration site, Piedmont’s registrars are involved at the front end of treatment upon diagnosis. The information they gather provides administrators, physicians, and researchers with valuable data regarding cancer trends and the number and types of cancers the facility treats. By mining this data, the facility can learn whether it needs to adapt or change programs or offer new services that support the 52 metrics recommended by the Institute of Medicine (IOM) in its three-year study conducted on behalf of the Georgia Cancer Coalition. “We can drill down on the information and easily give an assessment for the IOM report,” McCord says. “It enables us to easily extract data to prove just how well the metrics are being met. We help to gather important data and can take that information back to the medical staff and administration to help them make decisions that will grow our cancer programs.” For example, Piedmont has developed a successful wellness program to support posttreatment care that was developed based on information gleaned through the registry. McCord believes the shift from performing a role on the back end of care to being more at the forefront of treatment has helped the cancer registry department become more recognized for the valuable role it plays. “We can easily hold our own weight. While in the past, the cancer registry was thought of as a necessary evil, it is now just necessary,” she says.